About half of bloating and gas discomfort is caused by swallowed air — the other half is due to what you’ve consumed. When the gastrointestinal tract can’t move food through efficiently, or is unable to digest a particular nutrient, gas builds up in the lower intestine, causing bloating and discomfort. A diet rich in fruits, vegetables and healthy bacteria can help seal the gut lining and prevent bad bacteria (the kind that causes gas, bloating and indigestion) from entering the bloodstream. While all bacteria, regardless of good or bad, creates some gas during the digestion process, certain foods are more likely to trigger bacteria in a way that causes bloating. Many people claim to have stomach issues after consuming dairy products such as milk and cheese. The more common culprit of these symptoms is an intolerance to lactose, a milk sugar 65% of people have trouble digesting. There’s also a lesser-known potential offender called A1, which is a protein found in milk that causes similar symptoms to lactose intolerance. Beat the bloat: You can try lactose-reduced milk or milk alternatives like almond, cashew,, coconut, hemp, and oat. Just be sure to check labels as some of these are lower in protein and calcium, and higher in sugar, than the traditional cow milk-based variety. Some forms of dairy, like yogurt, kefir and even some cheeses (especially the hard, aged, salty kind) are lower in lactose and easier to digest. You can also try an over-the-counter lactase supplement before eating meals that may contain more dairy. If it’s the A1 protein causing the discomfort, look for A2 milk, available in select stores. Studies are small and further investigation is needed, but some say it’s worth the extra dollar or two. Broccoli, cauliflower, brussels sprouts, and kale all contain a non-digestible sugar called raffinose that can cause abdominal bloating. 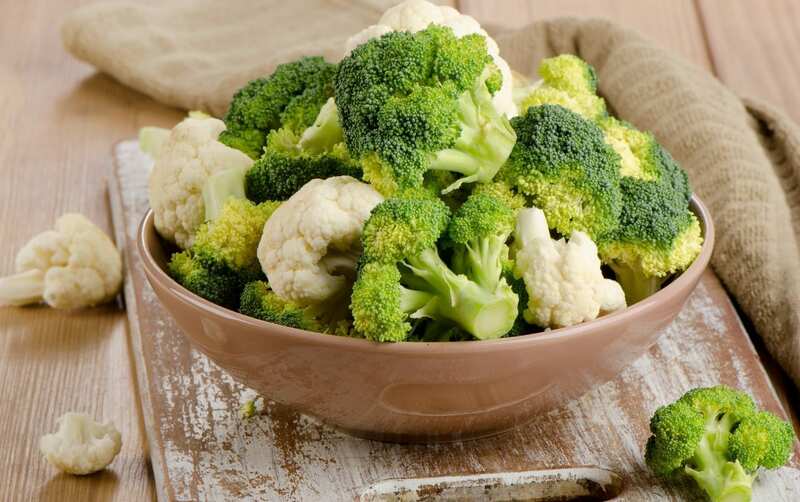 But don’t be so quick to cut them out; they also contain sulforaphane, a powerful antioxidant and key component in preventing certain types of cancer. Beat the bloat: Cooking or fermenting (think kimchi and sauerkraut) these types of vegetables can help break down the non-digestible fibers for easier digestion and less bloating. Fructose is a monosaccharide that is often difficult to digest and absorb, especially in high concentrations (like smoothies, fruit juices, coconut sugar and high-fructose corn syrup). It’s a simple sugar, which means there’s no need for it to be broken down, but the issue is in malabsorption. Fructose is typically absorbed in the small intestine, but in high concentrations or for those with an intolerance, it may travel lower into the colon where gas-producing bacteria are able to ferment the fructose, causing pain and discomfort. Beat the bloat: Stick to fruits lower in fructose, like apricots, avocado, strawberries, blackberries, blueberries, cranberries and grapefruit. Avoid processed foods heavy in high-fructose corn syrup like ketchup, fruit juice, sweetened yogurt, soda and many granola and pre-packaged bars. You might also want to limit dried fruits, which are more concentrated in fructose compared to fresh, whole fruit. Both sugar alcohols and artificial sweeteners contribute to bloating and gas. For example, sorbitol, a common sweetener found in candy, gum and sugar-free snack foods can’t be digested and is known to cause water retention. What’s more, early studies indicate artificial sweeteners disrupt our microbiome and boost the growth of the types of bacteria that cause gas. Beat the bloat: Read nutrition labels carefully and limit or avoid any foods containing sugar alcohols and artificial sweeteners like sucralose, aspartame, sorbitol and saccharin. Stick to whole foods, as many processed ones contain some sort of sugar substitute. Beans belong to a group of short-chain carbohydrates called FODMAPs, which are poorly absorbed in the small intestine. As a result, gut bacteria have more time to feed on the sugars, producing gas and bloating. Beat the bloat: Since beans are high in fiber, if you’re not used to getting enough in your diet it could make bloating symptoms worse. Add more fiber-rich foods to your diet slowly and opt for sprouted beans, black-eyed peas, lentils and mung beans, which are easier to digest. You can also pair them with something fermented like sauerkraut or miso paste to aid digestion. Wheat contains gluten and lectin, two proteins common to bread, beer and other wheat-based products that can cause bloating and gas in some individuals. Lectins may bind to cells along the digestive tract, disrupting the breakdown and absorption of certain nutrients.